The California State Athletic Commission has medically suspended eight athletes who competed in this past Saturday’s “Strikeforce: Rousey vs. Kaufman” event. After T.J. Cook rammed his face into Ovince St. Preux’s (Pictured) left fist, OSP could now be forced to ride the pine for up to six months. The former Tennessee Volunteer could return to action sooner with a doctor’s note. On the bright side, at least OSP walked away with the KO victory. Cook and Kieth Berry were levied indefinite suspensions, but each can come back earlier with physician’s approval. Derek Brunson: Suspended 45 days, with no contact for 30 days. Lumumba Sayers: Suspended 60 days, with no contact for 60 days for cuts on right eye and left scalp. T.J. Cook: Suspended 45 days, with no contact for 30 days. Issued indefinite suspension or doctor’s clearance for possible neck fracture. 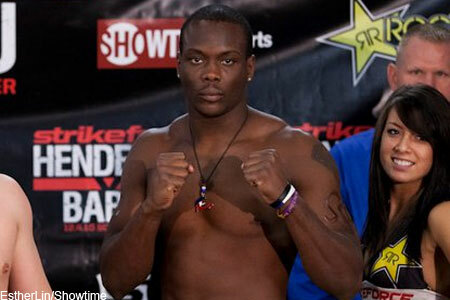 Ovince St. Preux: Suspended 180 days, with no contact for 180 days for left thumb injury. Can return sooner with doctor’s clearance. Julie Kedzie: Suspended 180 days, with no contact for 180 days for possible left shoulder rotator cuff injury. Can return sooner with doctor’s clearance. Miesha Tate: Suspended 45 days, with no contact for 30 days. Keith Berry: Suspended 45 days, with no contact for 30 days. Issued indefinite suspension or doctor’s clearance for hyper extended left knee. Hiroko Yamanaka: Suspended for 60 days, with no contact for 60 days for cut to right interior eye.